The most exciting development on the San Diego food scene is the ongoing Baja invasion—a distinct, high-end cuisine known as “BajaMed” and the influence of an equally exciting brand of street food. While several chefs have incorporated some of these influences, none has proved as creative with the full range as Chad White. All are on display at White’s new East Village restaurant, Común Kitchen & Tavern (925 J St.). Común’s everyday menu pays tribute to Baja’s rich street-food culture. From elotes (grilled corn cooked in lime juice and served in a cup with mayonnaise, butter and a garnish of crumbledchicharrón) to a diverse selection of tostadas, most of these dishes would be immediately recognizable—at least in broad outline—to those familiar with Baja’s street foods. The details, though, make the difference. Común’s octopus tostada is based on tentacles cooked sous vide (under pressure in a temperature-controlled water bath), yielding fantastically tender octopus chopped into bite-size pieces, charred on the grill and plated with Romesco sauce, red onion, cilantro and ripe avocado. Another standout was the smoked-shark tostada with a peanut and chili de arbol salsa echoing the earth and fire flavors of the shark meat with added richness brought to bear. Among the best bites at Común are its first. The tuna belly (toro) in chicharrón is God’s own canapé. You’ll wonder why anyone would ever want to eat toro or chicharrón without the other. The raw radish starter is simplicity itself, but the radish’s bite marries perfectly with the aioli’s richness, and the sea salt pulls every ounce of flavor out of the vegetable. 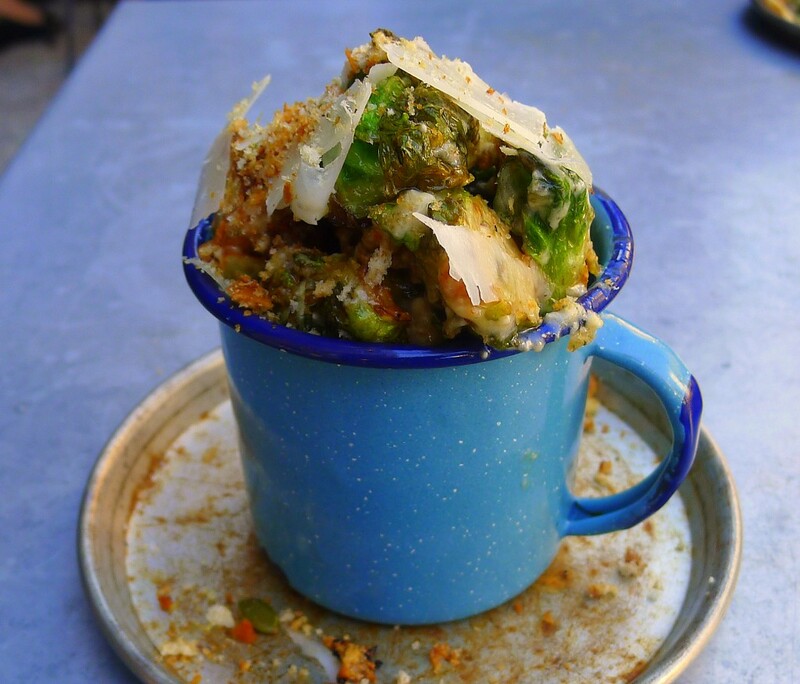 Fried Brussels sprout Caesar—a new starter for the winter menu—is a take on a Tijuana original (the Caesar Hotel where the salad was created is across Avenida Revolución from White’s La Justina Restaurant in Tijuana). This version is built around the crispy, caramelized fried Brussels sprouts I first tried—and loved—at one of White’s pop-ups. And it was one of the last of those Plancha Baja Med pop-ups, with Diego Hernandez of Corazon de Tierra in the Valle de Guadalupe, that provided the model for another crucial part of what Común is about: monthly “Mi Casa Su Casa” tasting dinners featuring high-profile chefs trading dishes with White. The most recent featured Michelin-star chef Drew Deckman. If Deckman’s yellowtail, yellow beets and capers was not the best dish of the evening, then White’s vegetable-forward cauliflower with sea urchin, black truffle and mushroom butter was. It was a world-class tasting menu focused on the heights of contemporary BajaMed cuisine for $60. These monthly events are not to be missed. Común highlights White’s unique take on what’s happening in the Baja food scene—and San Diego’s. He takes the essential elements of Mexican cuisine—the optimal local ingredients, the various techniques and heritages (indigenous, Creole, European, Asian)—and finds creative ways to present them. Perhaps the most amazing thing is not how different Mi Casa Su Casa is from the rest of the month but how similar.